Take a look at the following chart from VoteView. 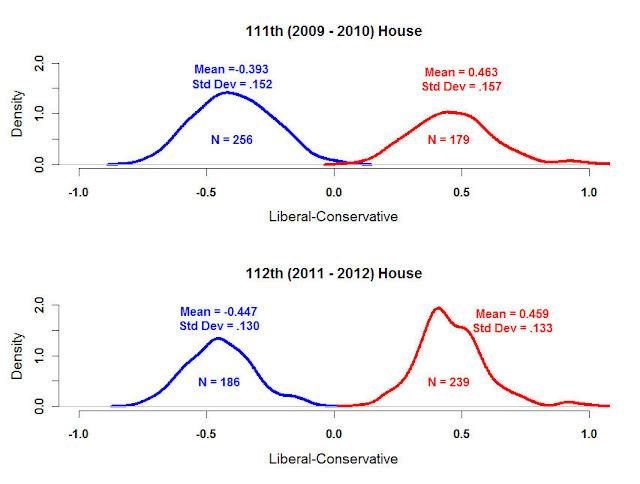 It shows the ideological make-up of the House in the 111th Congress (2009-2010) vs. the 112th Congress we have now. Both parties, particularly the Republican Party, have become ideologically pure. There are few centrists left in either party. This polarization is due in part to gerrymandering by both parties to create relatively safe and ideologically pure districts. This means that candidates in both parties tend to focus on taking ideologically pure policy positions and build ideologically pure voting records that will help them win the primary rather than the general election since they can be reasonably confident that a win in the primary almost certainly guarantees them election. Politicians elected in this fashion have very little incentive to work across the aisle with members of the opposition party or members with a different ideological orientation. This usually results in gridlock.